There are many pretty resorts dotted around Sri Lanka. However, if you are looking for best of the best, the only one you should be considering is Amangalla in Galle. 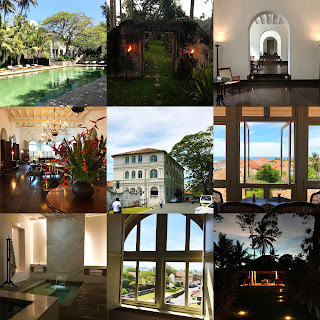 Not only the resort is part of an Unesco world heritage site, but it also has the most luxurious room and best service on the island hands down. The charming 18th century complex set within a 17th century Dutch fort used to be the New Orient Hotel. It was taken over by Aman group in 2009 and it had never looked more ravishing since its existance. Unfortunately, our experience at Amangalla started off on the wrong foot. When we arrived, we expected staffs bring us fresh towels and welcome drinks like they do at pretty much every Aman we have ever been to. Instead, we were made to wait at their lobby with no one to check us in. Now if I was at Westin or Hilton, this would be fine. However, we are at an Aman property and this is a very unusual reception from a brand that we love. It was head scratching to say the least. After 15-20 minutes or so, the temporary general manager (Pantelis) showed up and led us to our room. He was friendly and we felt at ease after a long day of traveling from India. Our butler then took over. We had few requests including a question about air taxi on the island (its schedule and cost). Our butler said that the air taxi is closed for the day so he won't have the answer until tomorrow. Fair enough. Then he proceed to ask me to remind him about the air taxi tomorrow as he may forget to check with them! I thought that was the oddest request from a butler. If he has hard time remembering (even though he looks like he's in his 20s NOT 60s), then shouldn't he be carrying a note pad so he can write down our requests? I mean whatever happened to Aman topnotch service? The room we were assigned to was absolutely beautiful. It was a corner suite right on Church Street with gorgeous view of ocean from multiple windows. The room essentially is divided into three parts: bathroom, bedroom area, and living room area. The bedroom is not enclosed from rest of the suite so technically it's not a one bedroom. We were able to tour quite a few of the guest rooms within Amangalla including spending a night at the Garden House Suite. My personal preference is the Amangalla Suite on the 3rd floor as it has the best view not to mention lots of light. The downside is that you have to climb 2 flights up and down everyday. If you have knee problems, I would definitely not recommend this room as there is no elevator within the premise and the climbs can be quite steep (Modern risers are 7" high. The ones here are higher and not uniformed due to age of the building). There are plenty of ground floor rooms to be had and most have view of the lush garden if climbing stairs is an issue. We decided to complaint to the new general manager Sean the following day about the shortcomings we experienced so far. To Sean's credit, he made us feel at home right away. We were assigned a new butler whom we love. Had he been our butler the first night, I think I would had a very different assessment of this Aman. We later found out that Sean just started managing Amangalla a day before we arrived! Hence the lack of arrival reception and poor training of the first butler and the driver who picked us up at Colombo airport. Sean came from Amanjiwo and Amanoi with twenty years of experience managing Aman properties and we literally saw him whip everyone into shape within 24 hours of our arrival. It was a sight to be seen. The guy definitely knows what he's doing. All the food we had was well cooked and seasoned. I would not say it's as good as one Michelin star restaurant but it was good. Pasta was al dente and tea was yummy. One night we had dinner with Sean and his beautiful lovely wife Lindsey. Turned out that Sean used to be a chef before managing Aman properties. They have wonderful stories to tell and just the loveliest couple to have dinner with. Our waiter, on the other hand, doesn't understand the proper way to take care of his guests (our conversations were interrupted by him multiple times, etc.). I can tell Sean knows he has his work cut out for him and I have every confidence that every staff at that restaurant had been retrained personally by Sean and is up to Aman standard within a month if not shorter! One thing I like to mention is the Roti dinner. If you have a chance, do it. It's offsite and done in a traditional pavilion where they lit up the pathway with torches and candles from the main road. You are surrounded by rice paddies and next to a lake. It's very romantic and pretty. You get a private chef and a waiter who are very professional and they serve you traditional Sri Lankan food which was quite delectable. The spa at the resort was absolutely gorgeous. There are hydrotherapy chambers where couples can go and enjoy sauna, sit in a steam room, relax in a whirlpool, or dive into a cold plunge pool. I believe there are two of them and they are free to all the staying guests. You just have to reserve them before hand. The treatment rooms were calming and zen like. Each room came with a bathroom with shower/ steam room. The water pressure was very good in the treatment room. The pool area is lush and beautiful. There are five cabanas next to a large pool where you can stretch out and have lunch. Or if you prefer to lie down in lounge chairs to catch some sun, there are rows of them for you to do that as well. While I was there, I saw maybe four, five people total so it was nice and private. There was no need to fight over lounge chairs. Aman is known for their local cultural experience offerings. Amangalla is no different. We had several which we enjoyed very much. One was going to a tea plantation where we learned the history and process of tea making (this country was called Ceylon after all). Another one was going to a cinnamon plantation where we learned everything and anything you ever want to know about cinnamon. We even had someone showed us how cinnamon was harvested and how it was put together as cinnamon sticks. I now see them in a brand new light whenever I am at my local spice isle in Whole Foods. We also visited several projects by Bawa brothers as well as their own homes. Bawa brothers are the most famous architect and landscape architect in Sri Lanka. They were born in early 1900s and past away about 20-30 years ago. Bevis Bawa, the landscape architect, is the older of the two and had a magnificent garden as one would imagine. Geoffrey Bawa, the architect, is the younger of the two and he was the original proponents of Tropical Modernism. His estate Lunuganga is not only a shrine of Geoffrey Bawa that one can visit, but you can also stay in some of the guest houses on the property! Definitely a treat for his architectural fans. Last but not least, your butler will take you around the 17th century fort and tell you the history of this important site. It's interesting to hear that the original fort was actually built by Portuguese before taken over by Dutch. Today, while majority of the people in Sri Lanka are Buddhist, most of the land owners of this iconic Sri Lankan fort are Muslims. The fort itself while touristy, is actually very charming and worth a visit if you are not staying at Amangalla. If you are coming to visit Sri Lanka, I cannot recommend this place enough. It had been over a month since I was there and I can assure you that any kinks that had not been worked out before Sean laid his hands on Amangalla, it had been worked out and then some by now. Sean had told me his vision for this wonderful resort and I have no doubt Amangalla will become one of those must stops for Amanjunkies in near future like Amanjiwo (which we have been) and Amanoi (on the to go list).